It is National Childhood Cancer Awareness Month. It was founded in 2010 by former US President Barack Obama and is mainly run in the form of awareness events by cancer charities. Childhood cancer is devastating to growth and development in children, and devastating to their families and friends. At a time when young people should be focusing on school, play and socialising, if they have cancer, their focus can be on medication, operations, and what life they have left. 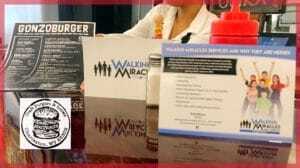 GonzoBurger & Mi Cocina de Amor have teamed up with Walking Miracles to support the cause. 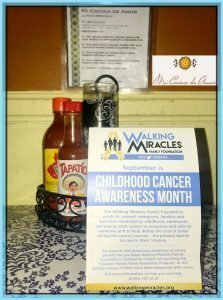 Both restaurants are giving their customers the opportunity to contribute/donate to this wonderful organization that helps families with children with cancer. Whatever you are comfortable donating, your server will just add to your tab. They are doing this the whole MONTH of September. Walking Miracles Family Foundation exists to connect caregivers, families and survivors impacted by childhood, adolescent and young adult cancer to resources and referral networks and to help defray the cost of travel during the cancer journey — the primary barrier to care in West Virginia. Thus, the first program they implemented was the Country Roads Travel Assistance Program. They have helped more than 200 families and have provided travel assistance to families in 33 of 55 West Virginia counties with our travel card that helps pay for gas, food and lodging. To date, they have given families over $35,000 in travel assistance. As part of their mission, they want to ensure the caregivers and survivors have survivorship plans and are connected to a survivorship clinic for proper follow-up. This includes education on the areas they received treatment and on the long-term side effects they might expect. This will better enable patients to seek quality care and live a high quality of life. Please support this effort if possible. Thank you.